When Emperor Meiji outlaws the ancient Samurai practice in the late 1800’s, Toyo Shimada has to find a perfect balance between cultural customs, and Besuboru, the sport he loves. Toyo is a 16 year old boy who loves to play baseball, but he is troubled by the suicide of his favorite uncle Koji. Although Koji’s death was meant to be defiant and heroic, it forced Toyo to really question his family’s background. And worse, he fears his father may be next. Toyo was accepted into a boys only elite high school in Tokyo, where the seniors take pleasure in tormenting the first years. The seniors call them girls and beat them up. Toyo is not allowed on the baseball team, and while all this is going on, his father finally pretends to care about him, and tries to teach him bushido, the code of Samurai. Meanwhile, at Ichiko, his friend Futoshi plays a prank that gets the whole school into an uprising. It is blamed on Toyo, and the punishment is that he has to run the cafeteria, and find a way to feed 600 hungry boys three times a day. At Ichiko, they were not told to focus on grades by the headmaster because they are guaranteed to be accepted to Tokyo College. One of Toyo’s roommates, Fuji does not believe this, because he thinks there are still Samurai in Japan. Fuji was the only boy from his whole prefecture to be accepted into Ichiko, and he thinks it is a great honor. Toyo wants Fuji to try out for baseball, but Fuji argues it interferes with his studies. Another problem is that Fuji has never played baseball before. He wants Fuji to try out because the team is missing a catcher and Toyo thinks that Fuji will be the perfect prospect. Toyo somehow convinces Fuji, and convinces his teammates to let him teach them Samurai, because they want to come better baseball players. It is at moments like this that Toyo proves he is up for whatever challenge is thrown at him. I lived every moment with Toyo, from fighting his father with wooden swords, to sneaking out over the Sacred Wall of Soul with his friend Futoshi, this book is an exciting thriller masterfully written by Alan Gratz. Throughout the book, he uses very descriptive language to paint a picture of the book. He “shows”, not “tells”. The suspense of the book is great, a cliffhanger and a page turner. An age restriction I would put on this book would be 11+, because it could be a challenging read for younger ages. 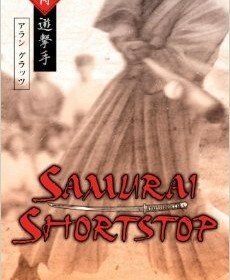 Samurai Shortstop mixes history, sports, realistic fiction, and humor in an exciting read.